We’d love your help. 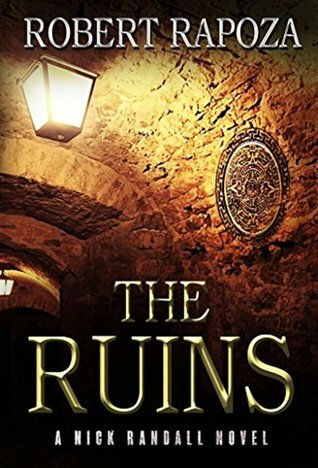 Let us know what’s wrong with this preview of The Ruins by Robert Rapoza. Randall’s beautiful daughter SAMANTHA learns o NICK RANDALL is an archeologist who believes mankind isn’t alone on Earth. When a mysterious benefactor funds his research, he departs to find the lost city of Vilcabamba. Hidden deep in the Amazon, Randall believes the city holds proof that his contentious theory is true. Upon arriving at the ruins, he mysteriously disappears. To ask other readers questions about The Ruins, please sign up. Is there a hardback or paperback version coming out soon? I want a copy. Robert Rapoza Yes, there is a paperback version for sale on Amazon. It just came available a few days ago. Thank you for asking. Robert Rapoza I’ve always been fascinated by the idea of lost civilizations and the daring men and women who search for them. When I was younger, I remember being…moreI’ve always been fascinated by the idea of lost civilizations and the daring men and women who search for them. When I was younger, I remember being glued to the TV when Leonard Nimoy narrated the show ‘In Search Of’. His deep, baritone voice, describing mysterious events, taking place in far off, exotic locales was almost hypnotic. I was hooked. Before his show, I didn’t know these types of amazing mysteries existed. Lost planes, ghost ships, civilizations unseen by humans for thousands of years were too good to be true. And the locations? The Bermuda Triangle, Easter Island, Ancient Egypt. I had to see these places. The Ruins is a book about some ancient ruins in the heart of the Amazon Rain Forest, that many believed were myth and didn't exist. One archaeologist, Nick Randall, in particular, believes that they do exist and is on the quest to prove it, and to prove that they come from an ancient advanced civilization not of this world. Most of his contemporaries had written him off as crazy, but one lone professor/ friend. Now, Nick Randall is missing. Others also believe that the ruins exist and hold the s The Ruins is a book about some ancient ruins in the heart of the Amazon Rain Forest, that many believed were myth and didn't exist. One archaeologist, Nick Randall, in particular, believes that they do exist and is on the quest to prove it, and to prove that they come from an ancient advanced civilization not of this world. Most of his contemporaries had written him off as crazy, but one lone professor/ friend. Now, Nick Randall is missing. Others also believe that the ruins exist and hold the secrets to a superior source of power and is in a race to find it first, but they are not scientists, but power hungry CEOs wanting to control the monopoly that this power source would give them. They are dangerous and will stop at nothing to achieve their goals. After Nick Randall goes missing, his daughter, also an archaeologist is sent to try to find him. It is a race against time and for their lives to try to stop the greedy businessmen and save thousands of people from an imminent volcano eruption, which find the ruins may prevent. The book was suspenseful, but a bit predictable. But I did like it well enough to want to read more of the series to see what happens next. I received this book from the author for an honest review, thank you! I’d like to send my thanks to the author and the publisher Ravenswood Publishing for giving me the chance to read this book in exchange for an honest review. In The Vilcambaba Prophecy we follow an archaeologist Nick Randall to the Amazon where he has been studying a tribe that lead him to the mysterious ruins of Vilcambaba. He is on a quest to prove his controversial take on technology and mankind thanks to the generosity of an anonymous benefactor. Little does he know that his benefactor will s I’d like to send my thanks to the author and the publisher Ravenswood Publishing for giving me the chance to read this book in exchange for an honest review. In The Vilcambaba Prophecy we follow an archaeologist Nick Randall to the Amazon where he has been studying a tribe that lead him to the mysterious ruins of Vilcambaba. He is on a quest to prove his controversial take on technology and mankind thanks to the generosity of an anonymous benefactor. Little does he know that his benefactor will stop at next to nothing to obtain what is fabled to lay in these mysterious ruins, putting his very life and the life of his friends and daughter in danger. Honestly wherever there is a good story about archaeologists, ancient prophecies, mysterious ruins and danger, I am so there. I knew this story was going to be like candy to me just from the description and I wasn’t disappointed. I enjoyed this book from the very first page. It had all the elements I love in a great adventure story – danger, betrayal, gunfire fights, mysterious relics, mysterious ancient ruins and a prophecy! While I expected these things, I was really surprised by the direction in which the story went sometimes, but in a wholly good way. Like I would never have expected this book to include extraterrestrial themes but it did and I thought that was extremely awesome as that has always been something I have been into. This book was fast paced and fun to read. It was a light read in both content and length, definitely possible to read this in one sitting due to it being so fun and interesting that you will want to keep reading it until the end. Readers will quickly realize that the author has talent. The action starts very early and continues throughout the tale. Everything, from the scene to the characters are so well described you will imagine you are there and will identify with them. I was not surprized to read that the author was runner up in a competition for new action tales. He deserved the recognition. The story itself is a good one and I read the whole in one session as I wanted to know how it ends. Robert Rapoza is definitely a name to remember and look for. This is a great page-turner! Had fun reading and could not stop until the end. Definitely one of my top thrillers as it left me wanting more. Suspenseful, fun, adventurous, Rapoza does a great job at bringing the exotic locations and characters to life and feeling the action up to the last and every single chapter. Highly recommend this to any sic-fi, adventure, thriller and all around action enthusiast to read The Vilcabamba Prophecy. Can't wait to see what else Nick Randall gets into. Very fast-paced, keeps you glued to the page to see what's next. Not for the squeamish, as the visuals of post-impact are quite explicit. There's manipulation, coercion, turncoats and traitors, bada$$ baddies, as well as archaeologists, Peruvians, scholars, space engineer, and beautiful, if dangerous scenery. Stick to publisher's blurb for clues, no spoilers here. Gifted to me through LibraryThing Giveaways. This was hard to put down. I'm a sucker for fantasy fiction that has anything to do with archaeology and ancient knowledge so this was right up my alley. Needless to say, I was pulled in from the beginning. I would like to have known more about the aliens but I guess I can look forward to a sequel. The story is good ... Really like Indiana Jones but have a bit of alien thing .. This is such an exciting book! I read The Bermuda Connection, which was Book 2 first, and it was so good, I had to come back and read The Ruins. This book was full of excitement, fighting, extraterrestrial influences...so, something for everybody! Now, I need a book 3! The Vilcabamba Prophecy by Robert Rapoza is a thrill packed action/adventure/fantasy that will keep the reader rivoted from beginning to end. The thrill-ride starts in the first few pages rigt after we meet Dr. Nick Randall when he becomes missing on an archeology expedition in Peru. His darghter, Dr. Samantha Rndall, is soon called in to locate him snd she finds herself in the same type of danger as her missing father. Now, both doctors and their expedition parties find themselves running form The Vilcabamba Prophecy by Robert Rapoza is a thrill packed action/adventure/fantasy that will keep the reader rivoted from beginning to end. The thrill-ride starts in the first few pages rigt after we meet Dr. Nick Randall when he becomes missing on an archeology expedition in Peru. His darghter, Dr. Samantha Rndall, is soon called in to locate him snd she finds herself in the same type of danger as her missing father. Now, both doctors and their expedition parties find themselves running form their persuers. Over the next few chapters they find themselves invoved in kidnappings and gun battles as they try to find each other and the acient city of Vilcamba. Even when you think they are out of danger do not blink because it is not over. The main characters in the book are well devolped and very believable. There is Dr. Nick Randall, the adventurous archeologist and academic with some contraversial theories; his daughter Dr. Samantha Randall; Frances Dumond, the head of the alliance; Colenel Ackers, leader of the mercinary forces; and several others. The interaction of all of the characters mesh together very well throughout the book. The dialog between the characters has been well thought out and fits in very well with the characters and situations they find themselves in at the time. One of the best examples of this is when father and daughter are reunited and Samantha says, “I thought you were dead, Is it really you?”. Some of the things the author does well in the book are maintaining the suspense and use of details. Mr. Rapoza keeps the suspense going in two ways. First, he use ciff-hangers at the end of chapters but does not make us wait too long before finding out what happens next. The second way is that just when we think the main characters are in the clear he puts them in danger once again. With the description he gives us plenty of detail to picture the characters, structures, and action without falling into the trap of going too far in detail. Archaeologist, Dr. Nicholas Randall, holds some controversial beliefs that nearly cost the man his career. Will they ultimately also cost him his life? On his latest academic adventure, he’s ambushed deep in the Amazon. Concerned that Nick has disappeared, his colleague, Dr. Francisco Andrade, begs Nick’s daughter, Sam, for help; but, trailing his path to Vilcabamba, the city her father hopes to find, Sam falls under attack as well. Turns out, Randall’s benefactor—wealth Move over, Indiana Jones! Turns out, Randall’s benefactor—wealthy industrialist, Francis Dumond—is suddenly now his enemy. Certain Randall holds the key to a highly superior power source, he’s deployed an army to seize control . . . But just for the sake of financial gain? The action thrills to the very end, and the cast of characters truly shines. Nick is a rock. A man of conviction, he dotes on beautiful, head-strong Sam, though she holds him to blame for her mother’s death. Then there’s conniving Francis Dumond. As evil as Nick is morally just, he’s the archaeologist’s perfect foil—a complex man whose damaged past ignites support of Randall’s beliefs . . .
And as for those controversial beliefs? Let’s just say, within the cast, there exists a unique, indigenous tribe that might just prove his hypotheses sound. This book is one-part boring video game and one-part Star Trek away mission. The main characters do little else other than shuttling between base camp, Cave Number 1, Chasm Number 1 and Grave Number 1. It got to a point where our hero goes on a quest to Grave Number 1 to retrieve an artefact, then goes to Base Camp to retrieve the same artefact, retrieves said artefact (which is of course under security so primitive even a cockroach could break in), leaves Base Camp, then returns after two pages This book is one-part boring video game and one-part Star Trek away mission. The main characters do little else other than shuttling between base camp, Cave Number 1, Chasm Number 1 and Grave Number 1. It got to a point where our hero goes on a quest to Grave Number 1 to retrieve an artefact, then goes to Base Camp to retrieve the same artefact, retrieves said artefact (which is of course under security so primitive even a cockroach could break in), leaves Base Camp, then returns after two pages ostensibly on a heroic rescue mission to save a friend (who ends up getting his brains pureed anyway), then goes back to Grave Number 1 to retrieve a book. Huh? The Star Trek away mission reminiscence is achieved by the sheer number of redshirt-like cannon fodder across the video game-esque adventures that our heroes undertake. There should have been a body count meter in this book. Half the characters serve no purpose whatsoever other than adding to the pile of corpses across caves, chasms, camps and caverns. This pathetic trend reaches its peak in a new character who appears midway into the book and promptly blows his brains out three pages later. A fruit fly would have a longer shelf life! I first picked up the book ... and just didn't have the time to read it. When I came across the audiobook, I was soo thrilled!!! And I was totally not disappointed and WOWED by the book and audio. Full effects ... reminds me of some of the higher quality podcasts when they first came out. Tight story, very exciting, informative (no info dump! ), and thrilling. The characters are mostly intense, flesh-and-blood with credible actions, reactions, and emotions. The estranged father-daughter relationship dissipated and they seemed to get along 'too' well, without any awkwardnesses. Until the final chapters. It wrapped up too neatly and emotionless, almost as if it was thrown together. Narration and production match the quality of the book. This is a sci-fi action/adventure novel with historical undertones. It takes place mainly in the jungles of Peru, in either the year 2012 or 2016 (the book does not make the time frame very clear). Nick Randall is an archaeologist with some very controversial theories that cause his peers to spurn him. He believes that mankind may have had some assistance in its technological development, going back hundreds of years. Otherworldly assistance. Set on proving himself and his theories to the world, This is a sci-fi action/adventure novel with historical undertones. It takes place mainly in the jungles of Peru, in either the year 2012 or 2016 (the book does not make the time frame very clear). Nick Randall is an archaeologist with some very controversial theories that cause his peers to spurn him. He believes that mankind may have had some assistance in its technological development, going back hundreds of years. Otherworldly assistance. Set on proving himself and his theories to the world, he travels deep into the Peruvian jungle with one goal: discover Vilcabamba, which he thinks holds the proof he needs. Samantha Randall is his daughter, also an archaeologist, who has not seen or spoken to her father in years. When she is suddenly informed that her father has gone missing in the jungles, she regrets that they drifted apart, and sets out to find him. Dumond is the evil force behind an elaborate scheme that could result in him putting his hands on what could easily be the most powerful tool or deadliest weapon on earth. To obtain this, he needs the help of the two Randalls... and he doesn't plan on giving them a choice in the matter. Nothing is going to stand in his way. And then there are Them. "Who are They? ", you may ask. You'll have to read the book to find out, now won't you? While it is part of a series and leaves some things to be answered in his next book, it is entertaining enough simply as a stand-alone novel. For a science fiction book, it was a good, entertaining read. This book contains some adult content, such as brief vulgar innuendo, bloody violence, and 58 occurrences of foul language, which I have detailed below so that people uncomfortable with foul language can judge for themselves how bad it is. 24 h*lls, 16 d**ns, 5 sh*ts, 5 a**h***s, 3 b**ches and sons thereof, 3 f**ks, and 2 a*ses. Robert Rapoza is the award-winning author of THE RUINS, a 2015 Clive Cussler Adventure Writers Competition Semi-Finalist, and THE BERMUDA CONNECTION, a 2017 Pinnacle Award winner and National Indie Excellence Award finalist. His action-packed thrillers have been described as a cross between Dan Brown and Indiana Jones, keeping readers riveted from beginning to end. Tommy Howell from Readers Favori Robert Rapoza is the award-winning author of THE RUINS, a 2015 Clive Cussler Adventure Writers Competition Semi-Finalist, and THE BERMUDA CONNECTION, a 2017 Pinnacle Award winner and National Indie Excellence Award finalist. His action-packed thrillers have been described as a cross between Dan Brown and Indiana Jones, keeping readers riveted from beginning to end. Tommy Howell from Readers Favorite calls protagonist Nick Randall "A statesman and action hero worthy of Pierce Brosnan or Liam Neeson." A member of the Southern California Writers Association he was selected to the 2015-16 Debut Authors program of the International Thriller Writers Association and was among several new authors featured at the Debut Author session at ThrillerFest in New York City. Find Robert Rapoza on Facebook and Twitter and sign-up for The Randall Report to learn about appearances, events and chances to win autographed books and other great prizes at http://www.robertrapoza.com/contact/.